It is late September in the year 1969, and you feel the cool breeze of autumn’s awakening on your face as you walk to the local record store. The Beatle’s just released their brand-new album, “Abbey Road”, and you are eager to get your hands on a shiny, novel, 12-inch vinyl. This will be the perfect addition to your newly introduced collection, now that these discs are the new fad. Ah, the feeling is so crisp on your skin: the plastic wrapping sliding off the elaborately decorated cover and the sleeve gliding from the black record to reveal the fragile piece of music. Steady, steady, steady, you say to yourself as you cordially place the disc onto the record player, easing down the diamond needle onto the first groove. The first beats of “Come Together” start to play, and alas, you are in pure bliss with your cool music and hip novelty. Not only were vinyl records a major innovation to the music industry in the 18th century, but they also effected the community and self-expression of individuals. Music listening devices have evolved greatly, beginning with Thomas Edison’s invention of the phonograph in 1877. Emile Berliner altered that in 1888 by fashioning a flat disc with choppy pieces of music to be played on what he called a gramophone. With the Depression and World War II taking place during the 1930s, further attempts to create a modern, easier way to listen to a record were being made. After several years of trial and error, Columbia Records introduced a successful long-playing record in 1948, and by 1955, the standard 12-inch vinyl had been formed. Not long after the invention of the modern vinyl did record labels and musicians take advantage of this wonderful new contraption, taking America by storm with the “musical era”. Rock ‘n roll, jazz, blues, and country artists all boomed with increasing popularity after the renovated invention of the record player and artists like Elvis Presley, The Beatles, Janis Joplin, and the Rolling Stones thrived with the success and growth of their music. Vinyl acted as more than just devices that played groovy tunes, however. They were a marketing tool used to popularize new artists and were a way for young adults and teens in this era to express themselves and their interests. Vinyl would come in eye-catching covers, large enough to be framed as a piece of art, and this was a way to appeal to buyers and fans without using the actual music. This was the most effective way musical artists could be analyzed and depicted for their image as well as sound. 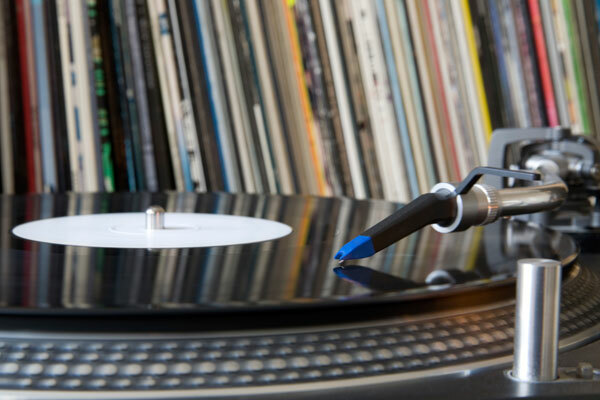 Record collecting became a major hobby and pastime, and showing your collection to others was extremely meaningful and symbolic to your personality. One’s taste in music says a lot about the person, and when he or she has a physical assembly of their favorite artists and songs, it acts as an effective method of self-expression. With the invention of CDs and eventually MP3s and digital music coming into play, vinyl began to fade into history, and companies stopped selling music in that large, discus form. It became a commonplace to disregard the inventions of the past and immerse oneself in the newest developments. Vinyl was believed to be a waste of space, impractical, and just plain old. However, ideas and movements of the past always seem to creep their way into the present again in a continues loop. Just as polaroid cameras, high waisted jeans, and floral patterns are being brought back from the past, vinyl is making a comeback in the trends of society today. Our culture is beginning to become more invested in art, self-expression, and creativity, shying away from stiff, monotonous norms. Individualism is a movement happening right now in the 21st century, and it is seen through the growth of self-expression, through things like tattoos, art, music, and poetry. Self-expression makes people feel special and lively. Just as people express their deep loves and qualities through inking their skin with tattoos, they are using the traditional vinyl to do the same. What once was an everyday vogue is now a hip, vintage way to celebrate life as a unique individual. Taking after my parents’ interest and love for music, I have always found vinyl very intriguing and satisfying. I started collecting after I invaded my mom and dad’s collection when I was very young. I became obsessed with and had a deep passion for old bands and musicians, which not many young girls share interest in. This made me unique as a kid, reciting lyrics to The Doors’ “Light my Fire” at recess as my peers seemed to be more interested in Hannah Montana and High School Musical. As I grew, I found my own modern musical interests and discovered countless bands of my taste. Not only am I thankful for these bands to be discoverable on the internet, but I also have bought vinyl for all my favorite musicians to add to my collection. My stack of vinyl is always first to be shown to my friends who visit my home. The uniqueness of my collection, consisting of various music from past and recent decades, shows my quirky personality. Just by seeing my choice in music tells people a lot about myself and what I have grown up with. I am not the only one with the interest in vinyl, as I have many friends beginning collections as well. Record stores are cropping up more and more in almost every city, and trendy stores, such as Urban Outfitters now sell vinyl in large amounts and use it as an aesthetically pleasing display. Again, the display and visual quality vinyl has serves as a strategy to pull customers into the returning trend. Society, especially the youth, always has an interest in old-fashioned trends, like the vinyl record, and through the spark of just one influential individual, the trend can flourish into existence stronger than before.